This is a full-day classroom only workshop at this time: Preview this workbook immediately! It has taken considerable resources from you and your organization to build a great team. Hiring qualified recruits who perform well and fit in with your company’s culture is no small feat. But how do you maximize the long-term payoff of your personnel investment? Your employees are one of your most important assets and keeping your most talented employees is vital to the success of your company. Turnover is not only costly in terms of replacement expense, but it also affects productivity. Successful team leaders and managers retain and develop their team members by learning how to discover the needs of employees, increase commitment from team members, and develop and implement a retention action plan designed to increase employee retention. 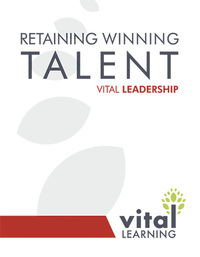 The Vital Learning Retaining Winning Talent™ course provides managers and team leaders with the ability to understand their effect on employee retention and the tools to retain their best performers. The course teaches productive, proactive steps that managers and team leaders can take to keep their best team members happy and dedicated to their jobs.